Michael: "I stopped listening to music when I was 17, and I stopped copying when I was 17, because I understood that I had a choice to either recycle what was already out there or to open up myself and show the world how I see it. Basically, my focus was on the art of lead guitar with pure self-expression, but it cannot be done perfectly, of course, because you cannot switch off the lobby or the elevator, or you cannot switch off METALLICA if you are in Paris and you're putting new clothes on and you listen to a whole album of METALLICA. That's how I discovered the song 'The Unforgiven', a fantastic song. Something sensational comes to the foreground, you can't escape from it because it comes out of every corner, but I made a very clear [decision] not to consume, to analyze or to even show [interest]. When I drive a car, I never switch on the music. I don't even listen to the news. I just use driving as a meditation to think of new things." Michael: "I actually don't practice — I play and discover. The play is important because it's recreational. There are no scoring; there's no competition; there's nothing — it's just joy of playing and discovering new combinations of varieties that come from within. It's a bit like treasure-hunting. You enjoy, because you know you're going to find something. When I play, I play the stuff that I know, and then I kind of put together different combinations, and all of a sudden, something magical happens. Then I capture that on a cassette recorder — five seconds, ten seconds — and it piles up and helps me making an album." Michael: "The guitar is the best, especially when the distortion came out, like when BLACK SABBATH and [LED] ZEPPELIN and so on. That made that instrument so perfect. It's the best instrument to completely express yourself in any direction. It has so many variations of what you can do with it — you hit the note, you can bend it, you can do the vibrato on top, you can just leave it there and do vibrato, you can hit it once, you can hit it twice, you stop hitting it, you can add and you can let it cry and sing, you play up there and you scream. You can really express a lot of stuff, so for me, it's the most complete instrument." Michael: "I joked to Michael Voss [-Schön, producer] in the beginning, 'Let's just send out the 12 songs, and maybe everybody picks coincidentally what they like and not the one that the other picks.' I didn't want to [have] three songs, three songs for him, three songs for him. It would have been too clinical. I wanted to combine it and have a few songs synced together. Then we did some combinations of backing vocals. It became really a very unique [experience], and it's so different from making a normal record. Everybody was on a different continent. We recorded in five different studios. In the old days, you have the band sitting in the control room while the producer is focusing on putting something together, and everybody quacks in the background. The producer at some point goes, 'Shut up!' Those days were actually very destructive when everybody was partying and just opening the door, banging the door, open the door, another joke. You don't get anywhere with anything. That's probably why many bands ended up two years in the studio – because they were more talking than playing. I think the main thing is today, you can cut all of that stuff out. I create a blueprint, because I focus on pure self-expression, so I don't want people to bring too much from the outside world into my design." 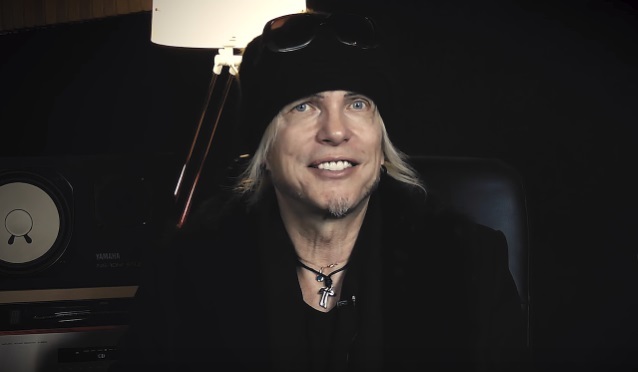 Michael: "MICHAEL SCHENKER FEST is a much bigger undertaking than anything I have done before. Four days after our release of 'Resurrection', we start an American tour, and it's a two-and-a-half-hour show. We're hoping that everybody is still standing by the end of it. It's the next experiment." Michael: "That depends. First of all, it's really like, who are you? Are you my brother, or are you me? There's a big difference. If you want to just become rich and famous, your best bet is to stick with a trend that makes lots of money and just copy it and be part of it and take a piece of the pie. If you're an artist and you want to come up with something fresh and new and you want to be creative, and you love that kind of being, then you do it from within yourself. It really depends on what you want. You have to ask yourself, 'What is it that makes me happy?' If it makes you happy to be part of a trend, go ahead and be happy with that way. It's all fine. But also the thing is, I'm very grateful that when I was 23 years old in '78, I was able to taste fame and success at its highest, and I was able to make a choice, and I said to myself, 'Do I need this?' I said, 'No, I don't need it, but I know what it is, and I will not miss it. I don't need it.' That's for my personality. Others, they may not make that same decision. Even worse, if you've never gotten there, you will always think you're missing out. That's why I said I'm grateful that I experienced it, because I know I'm not missing anything up there. My whole development in the three stages of my life, I am now in a place where I can enjoy all of those things. Nothing has to be. Nothing is a must. I can just freely be myself and do what I do." "Resurrection" will be released on March 2 via Nuclear Blast. The disc, which was produced by Michael Voss-Schön, was recorded in five different locations over a five-month period and features guest appearances by METALLICA's Kirk Hammett, Wayne Findlay and Michael Voss-Schön along with contributions from three original MSG (MICHAEL SCHENKER GROUP) singers — Gary Barden, Graham Bonnet and Robin McAuley — plus Doogie White, who plays with Michael in MICHAEL SCHENKER'S TEMPLE OF ROCK.